Over the past week, I've been working a little on Geoclue stuff. 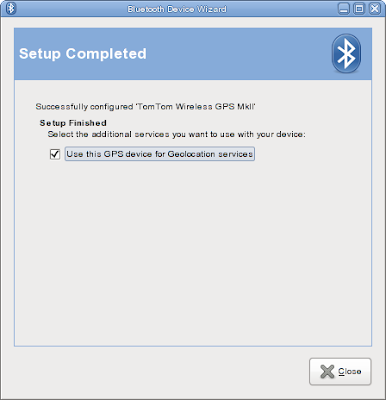 First up is a Geoclue plugin for gnome-bluetooth, which allows you to set up your Bluetooth GPS device. This will work best with the patches in the Geoclue bugzilla, so that the selection is instant-apply. The second piece of work is a Skyhook Geoclue provider. This code manages to put me within 20 yards of my house, though we should be getting NetworkManager's help to get the AP's MAC address. Finally, my Geoclue Firefox patch should soon be getting reviewed. It's been long enough that I forgot how to build Mozilla (probably a good thing). As an added bonus, I've sent a patch against NetworkManager to Dan with a gnome-bluetooth plugin, which should allow users to just tick a box to set up PANU Internet access. Now, we just need somebody reviewing all those Geoclue patches. Maintainer, where are you at? It would be interesting to feed GeoClue into NetworkManager to get a bit of extra network security - only connect to the corporate WLAN when GPS indicates you are inside corporate headquarters. Hey, Would also be cool to be able to use NetworkManager to get information about cell information if the device has a 3G/mobile card in it using the OpenCellID support that's in the git release of geoclue. Anon: there's a bit of a chicken/egg problem here, how do you tell you're in headquarters if you use the AP's MAC address to locate yourself for example. I don't really see this as adding much security either, but feel free to ask the NM guys. PANU as in PAN client to PAN server? That sounds great, I currently have to use the command line and disable NM to do this. Is it possible for you to write a blog post about this patch and some screenies etc.? Does it make sense to integrate your work and geoclue-properties? Alban: not really, as I'm working on the backend, and a different front-end point-of-access.